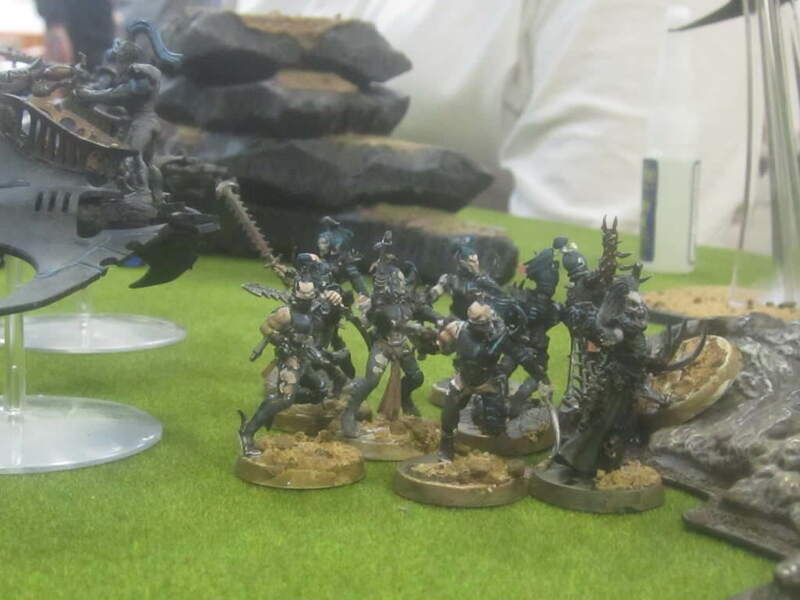 When I first painted up my Kabal of the Revenant Shroud , I wanted something other than the green/turquoise schemes I kept seeing on every other Dark Eldar army out there. I wanted a theme that reflected the Kabal name– something suitably dark and menacing– but not overly so. 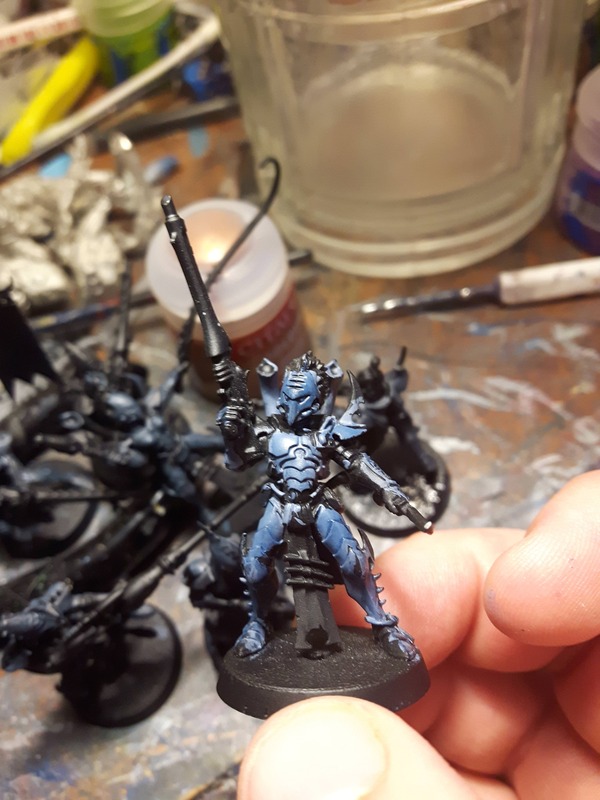 In the end, I went with a mid-grey colour scheme with ice-blue highlights, going for a look that, to me at least, trod the line between malevolence and barebones functionality– a delinieation that, to me, seemed appropriate for a Kabal that had effectively been living in exile. As you can see, my old colour scheme really was nothing to write home about. I quickly discovered how difficult it was to get grey shaded and hightlighted just right, and ended up with an army that, regrettably, looked like it had just come off of the sprue. To make things worse, back then my carrying case wasn’t the greatest, and so gradual wear and tear resulted in a lot of damage to my poor models. 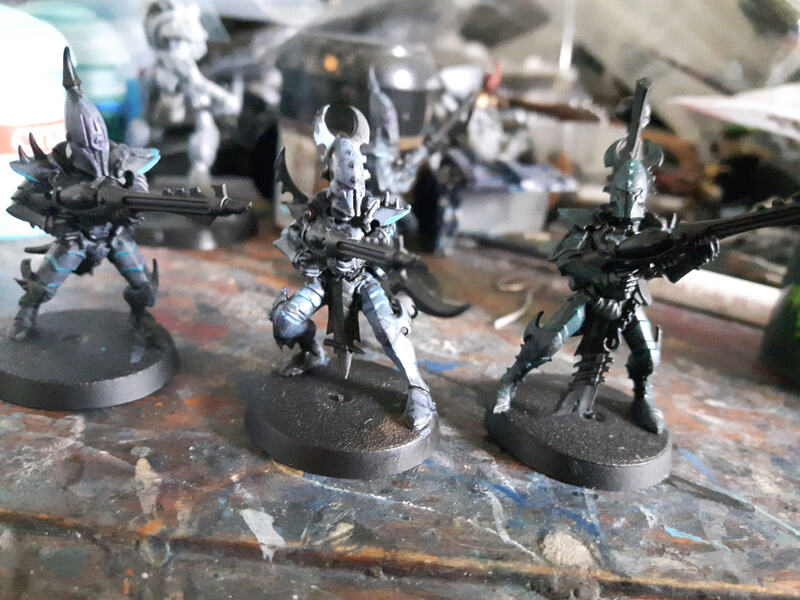 At first, I tried experimenting with (from left to right), a base of Dark Reaper followed by a lighter grey colour; an attempt at painting ivory (which turned out horribly) and an attempt at doing Incubi Darkness followed by Kabalite Green. 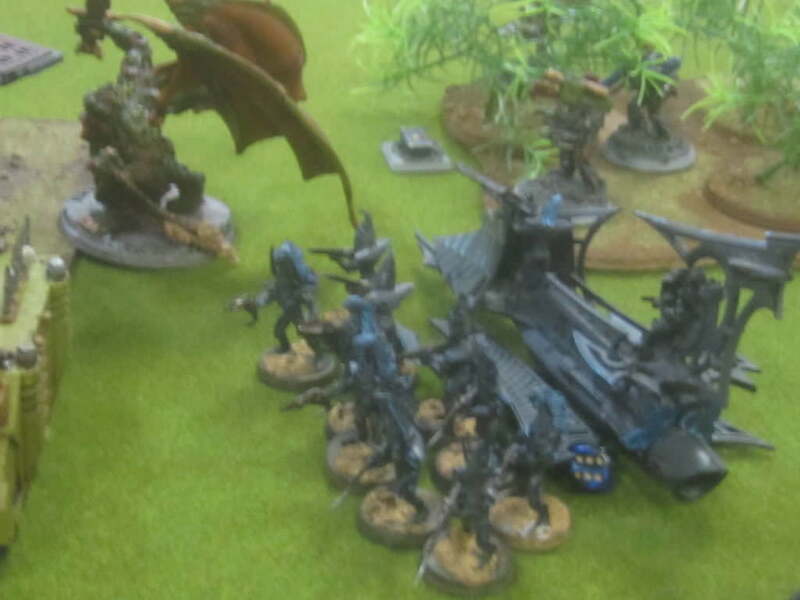 The grey one, I edged with Sotek Green just to see how well the two would work together. 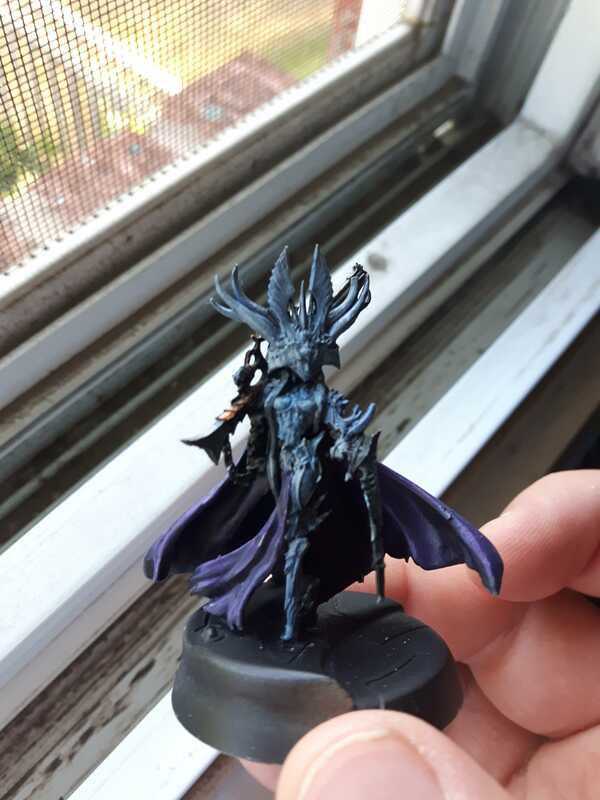 I had it in my mind that I wanted to go for a scheme that seemed ancient, or even “spectral,” and I was inspired in no small part by the way the upcoming Nighthaunt minis have been painted for Age of Sigmar. 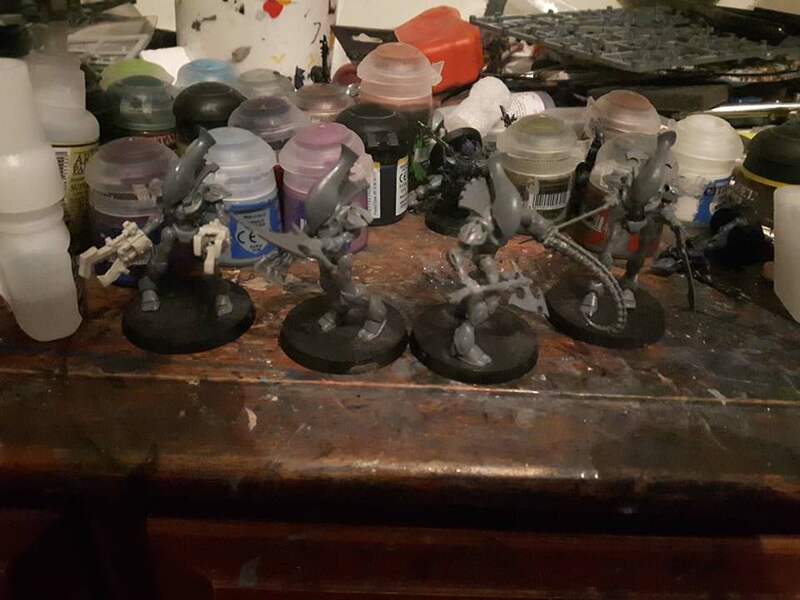 At some point in this whole process, I decided to base an entire squad in Dark Reaper, and see where I went from there. I think I was trying to do something similar to, or improve upon, my old colour scheme. Later on, I added purple to the plumage of this guy’s helm, just to add in some extra complementary colour. Note that I still need to do the flayed skin tabards of the Kabalites as well. Here is an entire squad in progress. Later on I intend to add ice-blue highlights to the edge of their armour, just to get a little bit more colour done on them. That, of course, will be a time-consuming effort, and after these six, I have thirty-odd more to go. 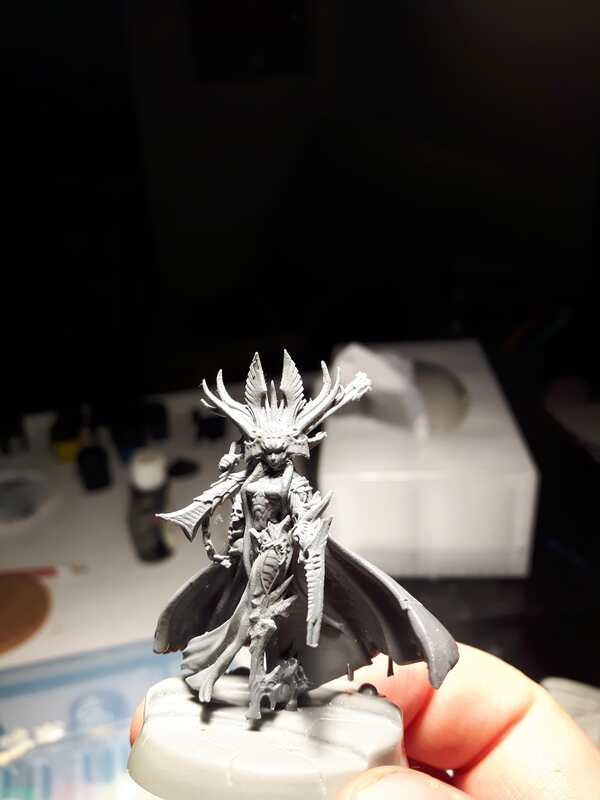 A while back, I acquired a new Archon model from Raging Heroes, although I had been avoiding painting her since. 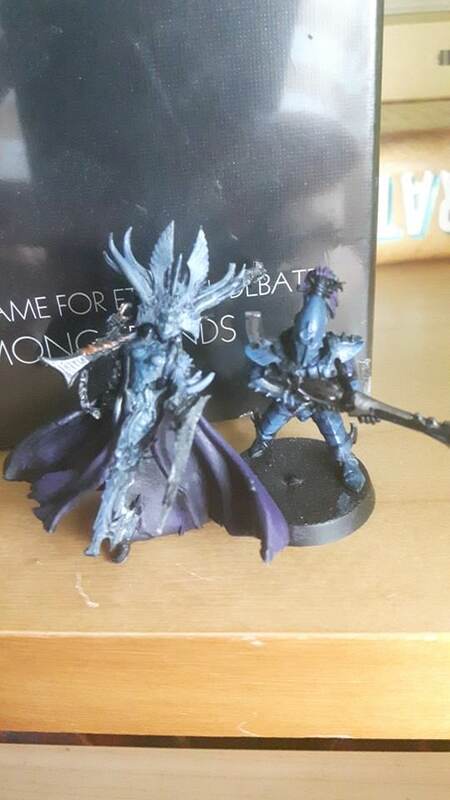 Given that I was uncertain of how I was going to be repainting my Drukhari, I wanted to be sure that I had a colour scheme in mind before I painted her. 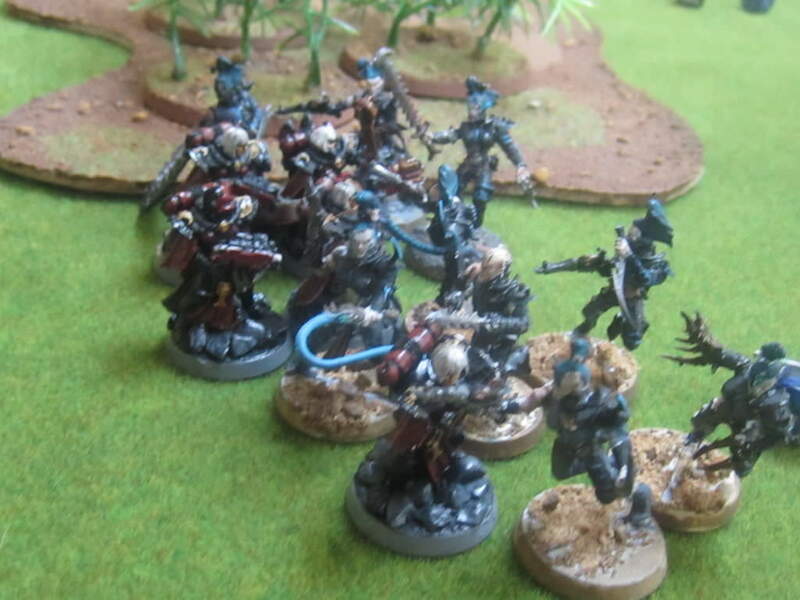 Even then, I wanted to be sure that she stood out– after all, she was going to be representing the big bad of my army, and I wanted her colour scheme to be distinctive in some way. Assembling her wasn’t too much of a hassle…except, however, that the tip of her little arm-blade snapped off when I first tried to transport her. Sadly, despite my best efforts, the tip keeps breaking off every time I try gluing it back on. I fear the damage may be permanent. If that’s the case…well, then I’m going to have to get used to my Archon having a rather stubby arm-weapon thing. At first, I debated painting the Archon silver or ivory to make her stand out from my grey Kabalites. However, I decided against it: I doubted I could make the details of the model (ie her eerily funerary-looking mask, her segmented armour, etc) stand out that well in silver…and I just find it really difficult to paint ivory. 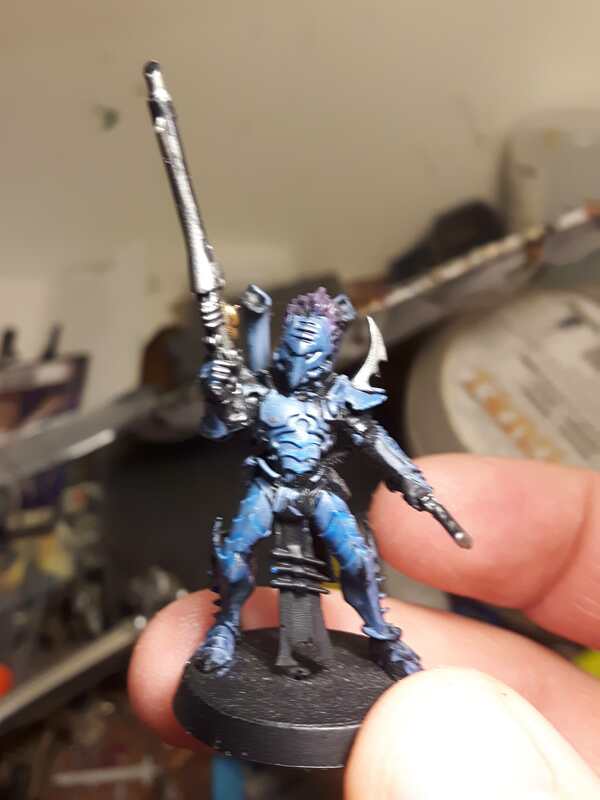 So instead I went for a lighter version of the Kabalite colour scheme, going for a straight base coat of Sombre Grey followed by a blue wash. Here is that initial attempt, shown next to a Kabalite for contrast. I have to say, I am loving how she looks so far. The grey/blue is turning out just right, and more importantly, is working very well with the purple. I still have to touch up her armour a little, and maybe add some ice-blue highlights to tie her further to the rest of the army. Her base came from a third party supplier (sadly I can’t remember which), and is pretty much supposed to look like an Eldar Craftworld base. I’m debating painting it a dull grey or a sharp bone colour, though a friend has also suggested scratching up the surface a little to make it look like a recent battle-site. Overall, though, I love this model: she has an easy, arrogant grace to her that makes me imagine her sauntering across a battlefield, unconcerned about enemy firepower and commanding the respect and fear of her followers. Ages ago, I hit upon the idea that my Kabal’s allied Haemonculus, instead of creating Grotesques normally (which is a relative term, depending on how “normal” you consider Groteques to be), and instead harvests and corrupts Wraithguard into horrendously altered wraithbone killing machines. It made sense to me, modelling-wise– Grotesques are roughly on par size-wise with the “standard” Grotesque models, as well as with Crypt Horrors, which I have seen used as the basis for so many Grotesque conversions. The Wraithguard, unlike the hunched, bestial Crypt Horrors, though, have a rigid, fluid look to them that, normally, makes them look like they are striding calmly and silently forward. It would be an image I would be all to happy to ruin with a whole lot of awkard poses and spiky stuff. For a background reason, I figured that my Haemonculus was less concerned about the torments that could be inflicted on the flesh, and was more interested on experimenting with the immortal, undying soul. 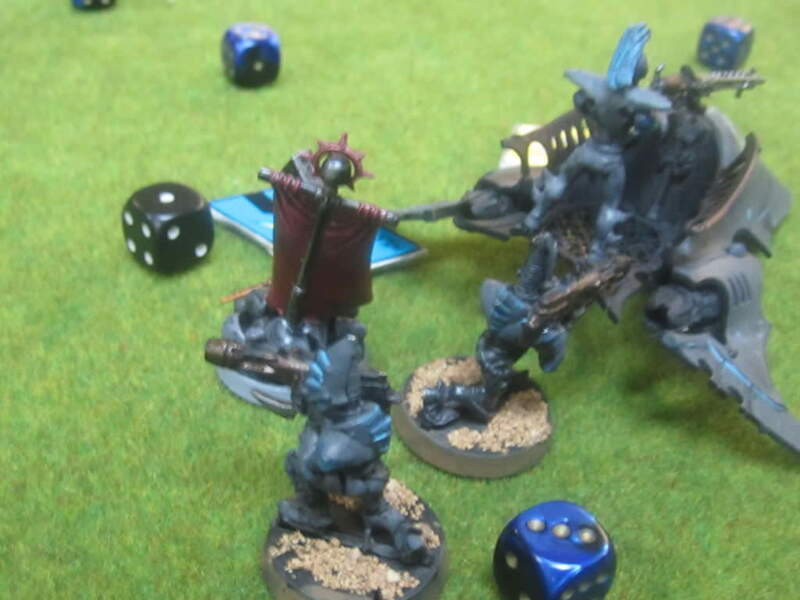 Hence, Wraithguard, and more importantly, the spirit stones within– and it was then that I realized that I had hit upon something far more horrifying than Grotesques, for the souls trapped inside the Wraithguard would no doubt be tormented to the point of insanity. 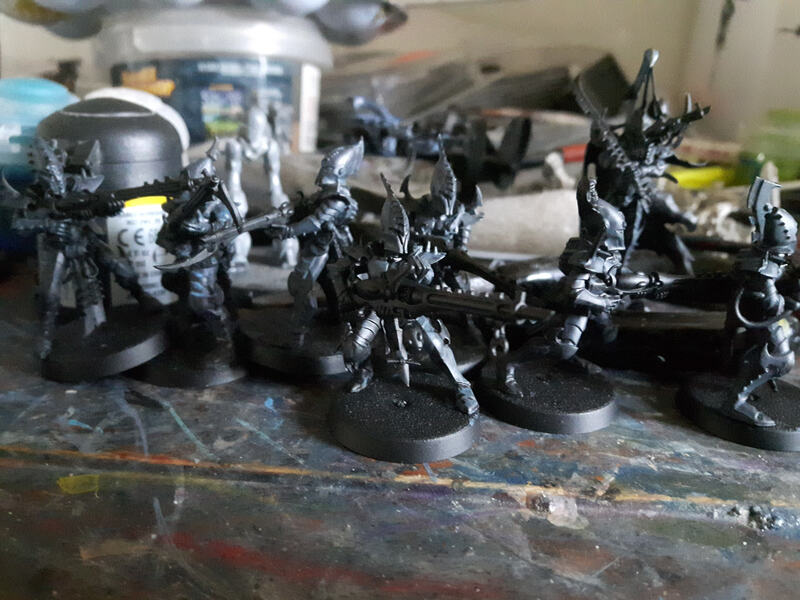 I started off with two Wraithguard, adjusting their poses slightly and replacing some of their arms with those from a Talos sprue (plus a bladevane from a Venom). In many cases, a lot of sawing and pinning had to be done to keep the new arms/hands/implements in place. 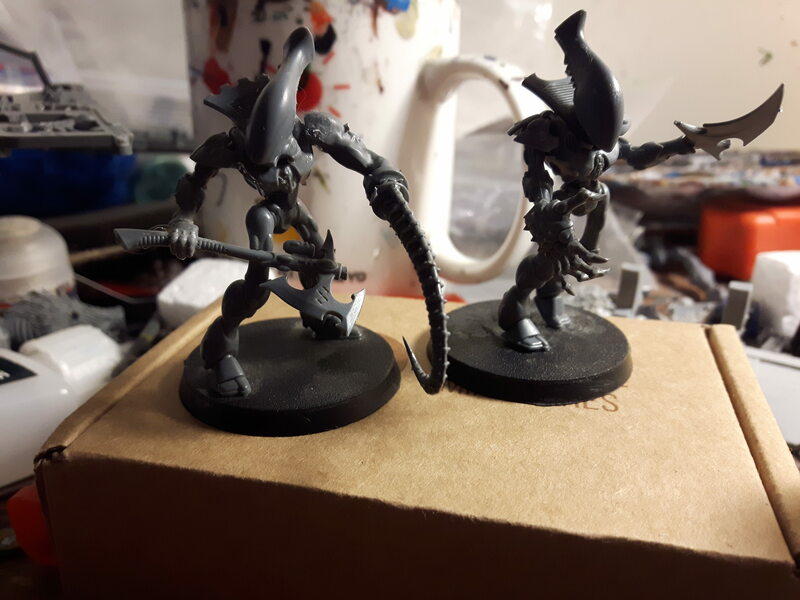 From there, I did two more– one, with leftover arms from a sprue of Kromlech mek-arms that I had lying around from when I’d converted my Arco-Flagellants, and the other, with its hands replaced by the blades of Wraithblades swords to create a “mantis”-type construct. I plan to create possibly up to 10 of these guys to form a terrifying giant unit of death, possibly later with some Taloi backing them up (what Hero calls “the Miserable Meat Mountain,” only in this case with 99% less meat). 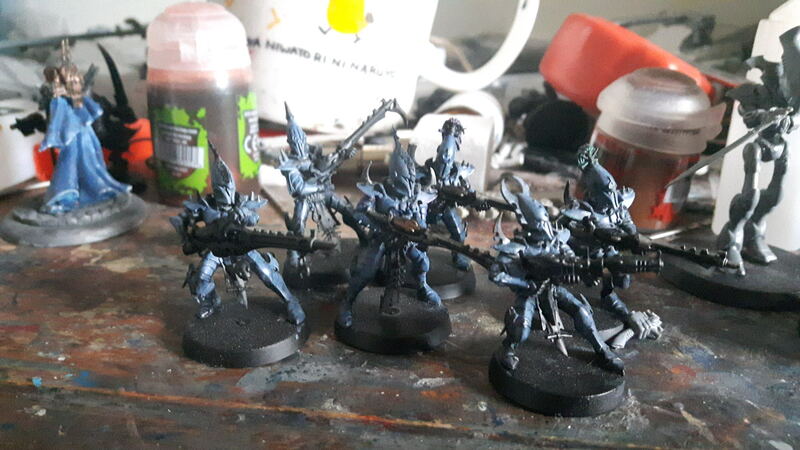 I don’t know how I’m going to paint them, at the moment, but I may use an exacto knife to carve furrows and cracks into their surfaces to make the Wraithbone look like its fraying under the pressure of its unholy alteration. 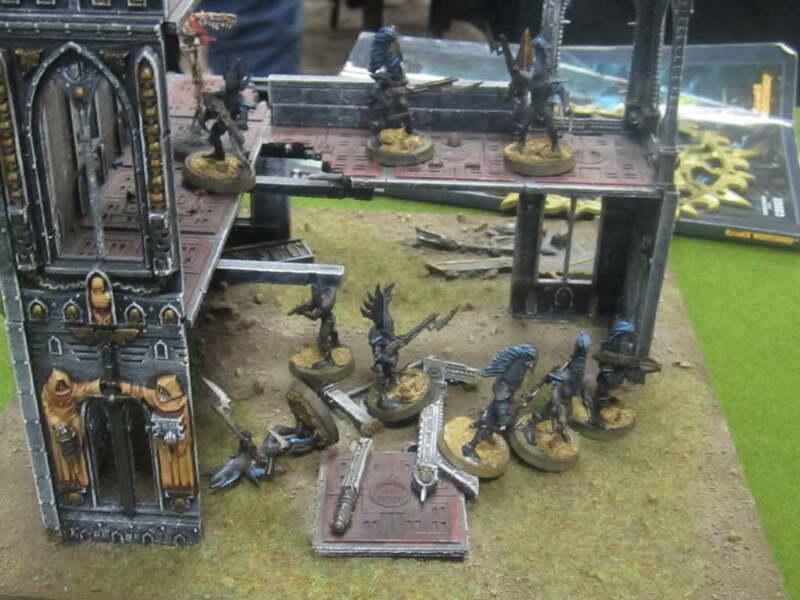 This entry was posted in Dark Eldar, Painting and Modelling, Warhammer 40k. Bookmark the permalink.